The days of screw tops, boxes, and drinking an entire 1.5L of Gallo in because you broke the cork again are coming to an end. After four years of research, Portuguese cork producer Amorim and US glass container manufacturer O-I have united nations of winos forever with the HELIX. Thanks to the HELIX's specially designed cork and internal bottle threads, you can skip the corkscrew and just twist this thing out. Once you've imbibed to your liver's content, stick the corkright back in the bottle like nothing happened. And the best part: somehow, over those four years of research, Amorim and O-I found a way to create a barrier that preserves an unopened bottle for up to two years. So while it may not outlast its classy competitors, it should fare better than that Franzia. 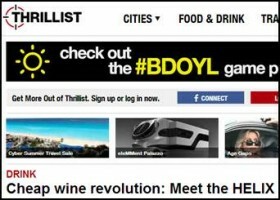 There's no word yet on when this game-changer will start partnering up with actual wineries. Big Bottle Opener surely hopes never.